No, Samsung is not the only company that mocks Apple and its mobile devices. Microsoft too. Of course, with much more elegance. And they have done it to the rhythm of a popular Christmas song from the United States . Basically, they have retouched the song to make fun of the iPad Pro. As you know, Apple has always presumed that its iPad Pro is practically a computer. Nothing is further from reality, even the apple fans know that it is not true. Yet. From Microsoft have taken advantage, promoting their Surface Go and mocking the fact that the iPad is not a real computer . Microsoft has used the Christmas song "Grandma Got Run Over Reindeer" changing its lyrics to "Grandma do not run out and buy an iPad" (Yaya do not hurry to buy an iPad) in an ad whose protagonist is an adorable girl 10 years. 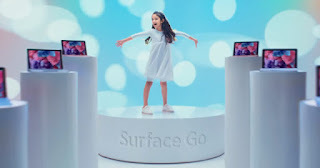 In the commercial spot of the Surface Go, obviously aimed at the Christmas campaign, Microsoft also refers to the iPad "is fine when you are 6 years old but not when you have 10" and that "when your dreams are great you need a real computer "
The truth is that the advertising spot is not bad. It is cheerful, fun and elegant. Although it is a bit strange that all companies focus on disqualifying Apple's iPad Pro , and that takes away points. But it is the rival to beat, and that is that Apple's iPad continues to be a leader in sales year after year. What do you think about the new Microsoft TV ad? Did you like it? We wait for you in the comments and in the social networks!